When I was a child the Infant of Prague sat upon my upright piano I spent many years practicing on. The only time I saw the statue move was during our Hershey, PA church’s annual summer parish picnic. My Irish mother moved him towards facing the wall to insure there would be no rain. Until I started living in central Mexico I never saw the Infant of Prague again. Suddenly, he was everywhere including many churches in San Miguel de Allende. 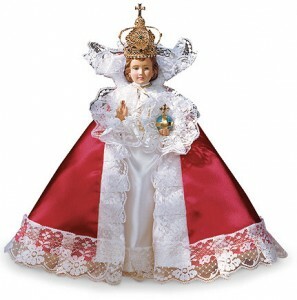 The Infant of Prague is a 16th-century Roman Catholic wooden statue of child Jesus holding a globe. Pious legends claim that the statue once belonged to Saint Teresa of Avila. St. Teresa gave the statue, originally from Prague, as a wedding gift to a Spanish noblewoman. This woman gave it to her daughter at her wedding. The daughter then gave the statue to an order of nuns upon her death. The devotion to the child Jesus was especially popular in 16th century Spain, and the Spanish explorers brought the devotion to the New World, and thus in most village churches in Mexico and across Central America you will find a little ‘Infant of Prague’. The statue’s raised two fingers are a blessing gesture symbolizing the two natures of Jesus and the three folded fingers represent the Holy Trinity. In Ireland, devotion to the Infant of Prague and belief in its power to influence the weather is still strong with brides facing him to the wall to insure a rain-free wedding. In both Ireland and Mexico, a wedding gift of a statue of the Infant of Prague is particularly auspicious.